Recently, i came across a notfication with error "Condider replacing your battery" on my Windows 7 laptop. Well that was expected as laptop turned 3 years old and the batteries of laptops needs to replaced afteer 2-3 years as their capacity gradually degrades with time and utlimately throw error of Replacing it in the notification box. 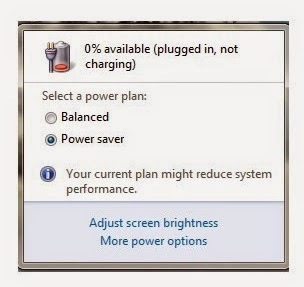 Such notification appears on Windows 7 laptops when your battery is unable to hold 40% of total charge.Back-up of batteries reduces to just 15 to 30 minutes and as long as charger is plugged in, you will be able to run laptop.If you are getting Condider replacing your battery notification on your Laptop, it's means you need to get a new battery. I purchased new battery for my Dell Inspiron 14 R N4110 from dell retailer shop and it cost me Rs 2200. When i plugged in firstly it showed notification as Plugged in, not charging and after that i got Notification as No Battery detected when i restarted the system. Fisrtly check the BIOS setup -F2 at powerup(for Dell, F10 for HP) . It will confirm whether system is able to identify the AC adapter or its listed as Unknown. If you are getting similar Notification on your Laptop,here is a Useful tip that you need to do and hopefully it will get fixed. Make sure your AC adapter is properly connected to laptop / Might have been half plugged. 4. Reinsert the battery and start the computer. In my case the Notification was removed and Changed to Plugged in Charging after following above steps. Try updating the BIOS and Chipset drivers.In case problem still persists, then probably the problem lies in battery itself.